Mixology Monday time again, and Sonja at Thinking of Drinking has chosen "All about Absinthe!" as the theme this month. The fist time I tried "la fée verte" was years ago in Prague, and somehow a bottle of the stuff followed me home, must have accidentally got stuck in my luggage at some point, since it was then unavailable here. Unfortunately, that bottle of stuff from the Czech Republic was kinda vile, and it still gathering dust somewhere on the back of my bar, but it was a fun novelty to have around. 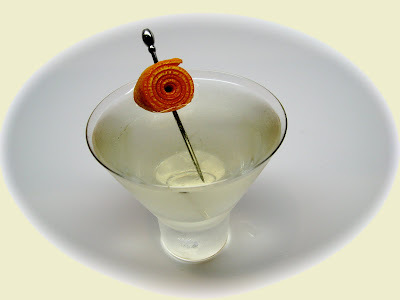 My favorite uses of absinthe are in cocktails where you just use a tiny amount, such as the rinse for a Sazerac, the ½ tsp in the Remember the Maine, or the drops or dashes in the Corpse Reviver #2. Some Sazeracs on a trip to New Orleans years ago are in fact what first turned me on to real cocktails. (Similarly, I never really appreciated wine until a trip to Bordeaux back in college.) The touch of absinthe can really pull things together and adds a lot of complexity, a bit like the function of bitters I suppose. I think this gives a really fun louche effect. For the drip I used the excellent St. George Absinthe Verte. Marteau is another of my favorites which I tend to use in my sazeracs. This was about 1½ oz St. George to 5 oz water, but adjust to taste. And don't worry about the sugar, only part of it gets dissolved by the cold water lending just a bit of sweetness to balance the absinthe's heat; it's still a pretty dry drink. I always like coming up with at least one new cocktail recipe for Mixology Monday, so here's one using just a touch of absinthe for similar reasons as discussed above. UPDATE: Here is Sonja's roundup of all the entries (so many it took 2 posts), Part I and Part II. I tried this with Bulldog, I had some in the back of my cupboard, then with my favourite Martin Miller's Westbourne Strength, it was a lot better. I think that the citrus orange notes a pepperiness which are quite pronounced in both Martin Millers Gins work really well in most cocktails using Cointreau. Never tried the Martin Miller's, I'll add it to my list of bottles to pick up sometime and give it a try. Looks like an interesting cocktail to try, thanks for the post! Cheers! This works wonderful with the NOLET'S Gin! Thanks, I'll have to give it a try.